The Cass Park Arena Enclosure Campaign is a community-wide effort to raise funds needed to fully enclose the arena is in its second year under the auspices of the Friends of the Ithaca Youth Bureau (FIYB), the nonprofit organization that exists to facilitate support for the Ithaca Youth Bureau (IYB). 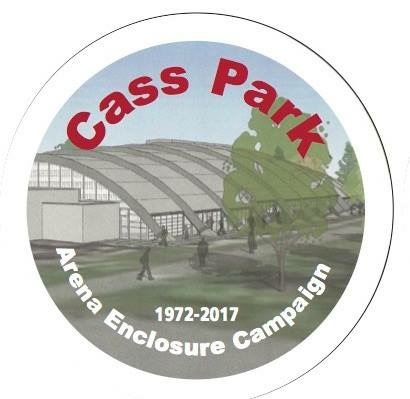 Ithaca area businesses are encouraged to become sponsors of the Cass Park Arena Enclosure and the upcoming Celebrate Cass! 45th Anniversary Party by the “Incodema Initiative”. Sean Whittaker of Incodema wants to inspire the Ithaca corporate community to support the enclosure project by matching their gifts. Every dollar pledged in 2017 by businesses will be matched by Incodema’s generous multi-year commitment. Other incentives to contribute to the campaign include naming opportunities, tickets to Celebrate Cass! on Sept. 30 event, and dasher board display advertisements. Information about the capital project and ways to get involved is available at www.friendsiyb.org/cass as well as on Facebook as “Cass Park Campaign” and Twitter @CampaignforCass. Mail can be sent to Cass Park Campaign c/o Friends of the Ithaca Youth Bureau, PO Box 4198, Ithaca, NY 14852. The Cass Park Campaign’s goal of $1 million supports upgrades that retain the arena’s traditional charm while making the city-owned and managed facility more sustainable and successful. Cass Park is a four-season community resource that was first opened in November 1972 as an open-air ice rink. Everyone who has benefited from its 45 years of “fun, fitness and friendships” is encouraged to participate in the campaign and events.